MOLINE -- A feature-length wardrobe program has played for a year now. 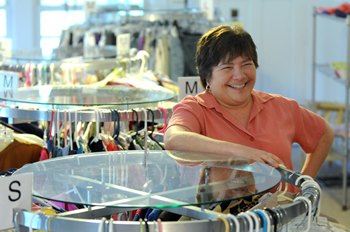 A clothing ministry produced by Riverside United Methodist Church, and based on the C.S. Lewis book The Lion, the Witch and the Wardrobe celebrated its first anniversary with an open house June 4 at its 2418 41st St. site. The building used for the clothing ministry is a former parsonage near Riverside's Life Center. It opened last May in a garage at the church's 712 16th St., downtown Moline location. ''We have grown a lot, mostly by word of mouth, and from fliers we have distributed to organizations that support the needy,'' church outreach coordinator Kris McMillan said. A new outdoor sign planned to be installed as part of the open-house celebration should improve its visibility in the community, she said. Different rooms in the brick home contain clothing for women, men, children and teens. Shoes also are available, which was a specially good thing for one client, an African refugee who World Relief sent directly from the airport to The Wardrobe on one cold, wintry day. ''He was still wearing flip-flops, and was so thrilled to get his first pair of shoes from us,'' Ms. McMillan said. Stories such as his and gratitude expressed by other customers ''often bring tears to your eye,'' volunteer Carole Poppy said. High gas prices often are cited as reasons people don't have enough money for clothes, Ms. McMillan said. Apparently, economic conditions have hurt similar clothing ministry outlets, Ms. Poppy said, remembering when a young pregnant woman and her daughter came to The Wardrobe, saying the place they had been going to had become too expensive. People who bring in old clothes also are allowed to trade them in, and not have to pay $1, she said. In time, she hopes other churches will support The Wardrobe. Ms. McMillan wants the open house to be a celebration and an invitation to people who need nice clothes, some of which still have price tags on them, she said. She said she had no doubt The Wardrobe would be successful.